We live in an era of health hype and nutrition propaganda, and we’re suffering for it. Decades of avoiding egg yolks, choosing margarine over butter, and replacing the real foods of our ancestors with low-fat, processed, packaged substitutes have left us with an obesity epidemic, ever-rising rates of chronic disease, and, above all, total confusion about what to eat and why. This is a tragedy of misinformation, food industry shenanigans, and cheap calories disguised as health food. It turns out that everything we’ve been told about how to eat is wrong. Fat and cholesterol are harmful to your health? Nope—they are crucial to your health. “Whole grains” are health food? Not even close. Counting calories is the way to lose weight? Not gonna work—nutrients are what matter. Nutrition can come from a box, bag, or capsule? Don’t count on it! 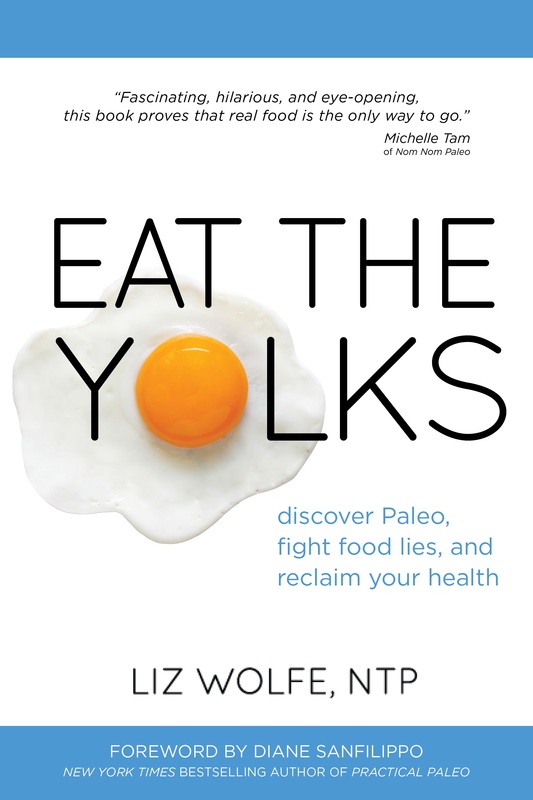 In Eat the Yolks, Liz Wolfe debunks all these myths and more, revealing what’s behind the lies and bringing the truth about fat, cholesterol, protein, and carbs to light. You’ll be amazed at the tall tales we’ve been told in the name of “healthy eating.” With wit and grace, Wolfe makes a compelling argument for a diet based on Paleo foods. She takes us back to the foods of our ancestors, combining the lessons of history with those of modern science to uncover why real, whole food—the kind humans ate for thousands of years before modern nutrition dogma led us astray—holds the key to amazing health and happy taste buds. In Eat the Yolks, Liz Wolfe doesn’t just make a case for eating the whole egg. She uncovers the shocking lies we’ve been told about fat, cholesterol, protein, carbs, and calories and brings us the truth about which foods are healthy—and which foods are really harming us. You’ll learn truths like: - fat and cholesterol are crucial, not harmful . . . and why - “whole grains” are processed foods . . . and what to eat instead - counting calories is a waste of energy . . . and what we actually should be tracking - all animal products are not created equal . . . and which ones we truly need - nutrition doesn’t come in a box, bag, or capsule . . . and why there’s no substitute for real food!